Medical Program: How Much is My Medical Practice Worth? Hey everyone, this is Keith Gruebele. Welcome to episode #2: How much is my medical practice worth? If you’re the owner, then managing a healthcare business is just as important as practicing medicine. And if selling your practice means retirement for you, then wouldn’t you want to be managing that asset as best as possible? Wouldn’t you want to know that you’re setting yourself up for the success you deserve after all the years you’ve put in? The first thing we’re going to talk about is understanding why you should know the value of your practice. 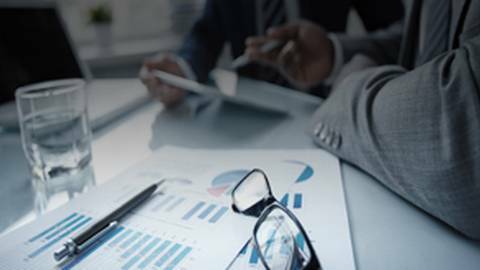 What’s so important about understanding that valuation – not just at retirement time, but throughout your entire career. Secondly, we want to touch on how to evaluate the value of that practice. How do you know the worth? How do we look at it? The third part we’re going to talk about is what you can do to increase the value of your practice. Let’s dive right and start with understanding what you need to know about the value of your practice. I want you to stop for a second and think: What is the most valuable asset in your life? I’m going to bet to say that your practice is the largest asset that you will ever have or own. You purchased this asset, you’ve invested years of time, energy, effort – you sacrificed for it so that it would grow, feed you, give you the opportunity that you and your family would hope for, and you’ve also looked to eventually sell this practice and move forward, leveraging that to finance your retirement. Make sure that you have the quality of life and live the quality of life that you want throughout your longer years. So, don’t you think we should take some time to really understand how we can maximize that investment, how to maximize that return? I mean, realistically, you look at these numbers all day long, but you look at them in different aspects. You start wondering about what kind of percentage you’re getting on a CD or savings account; you manage your stock accounts, you measure them almost daily, looking into what kind of return on your investment you’re getting; you track the value of your home constantly, but when was the last time you stopped and understood the value of your practice? See, the reality is, as I mentioned earlier, for most people in the healthcare industry, selling your practice is the key to your retirement. It’s going to be what finances you throughout the rest of your life. As a matter of fact, some statistics say that approximately 73% of healthcare people say that their practice sale is going to be what funds their retirement. As you see the industry is consolidating and as you start planning an exit strategy, it’s important that you get ahead of that curve and not wait until the last couple of years to understand that value and maximize the opportunity that you have there. It’s really important that you start preparing for that exit strategy much earlier on in your career. Doctors today are practicing for a lot longer than they did in past lives. The reason for that is they weren’t financially prepared to exit when they had to. So let’s talk a little bit about understanding the value of that practice, what we need to do to value it, and how we can maximize it, increasing your worth and, again, funding that retirement, and applying an exit strategy that works for you. When it comes to understanding the value of your practice, you have to evaluate the worth. This is a question that has been asked multiple times and continually evolves as you look at finance. The way that we measure the value of things changes. That’s in everything, from the way you measure the stock market or gold, but it also relates directly to the healthcare industry and how we valuate practices. 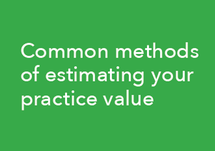 There are four main ways that people would valuate a practice and understand its worth. The first is the percentage of prior year sales. It’s a really simplistic way to understanding the value of a practice by understanding in prior years, how much did this practice originate? Again, what is the asset giving, essentially? You’re looking at return on investment in a model like this, and this is really simplistic and easy and applies mostly to solo practitioners. You want to be able to very easily identify one way to know the value of the practice in something that people can relate to. Again, to minimize confusion, this is one way to go about it. Simply looking at the prior year’s sales, or the prior 12 months’ sales, and negotiating a percentage thereof. The second way is looking at the net income, which are the take-home dollars at the end. It counts in all of your expenses and this is more for small group practices or solo practitioners that can say this is the income that I’m able to draw off of this practice, this is what I’m able to earn at the end of the day. Again, a very simple approach of looking at it, but not necessarily one of the most popular approaches, but one that tells you at least how much this asset that somebody will be purchasing or that you’ll be selling will be able to give off as far as income is concerned. The third and what seems to be the most popular today is the EDITDA method. EBITDA, as many of you know, stands for earnings before interest, taxes, depreciation and amortization. This has really become an industry standard across all of healthcare. 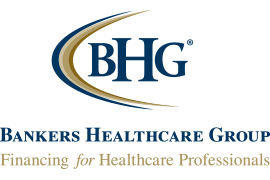 It really offers a standardized method of understanding all of the earnings of the healthcare practice and it doesn’t allow for variants depending on what the write-offs are for that particular healthcare professional. What do I mean by that? Different people write off different expenses for their business. Some may have a car allowance, others may have cell phone expenses, some may spend more time traveling for continuing education credits. When you look at all of those expenses, it comes off of the net income. So, looking at EBITDA where you’re just taking your earnings before the interest, taxes, depreciation or amortization helps give you one standardized scale of measurement that you can apply across all markets. The fourth is the market rate multiples. This tends to be for much larger practices that are generating multi-million-dollar revenue annually. These offers are largely looked at by larger equity groups that are trying to purchase it. Those four methods are the primary ways to evaluate practices. Again, today, EBITDA is becoming the most standard method and multiples of EBITDA are very common, depending on what area of healthcare you specialize in. I’d highly recommend taking a couple of hours, maybe on a Saturday or Sunday, to sit down and sharpen your pencil and understand the value of your practice. There’s’ multiple formulas that you can find online very easily, or by consulting with a practice consultant or a practice transition specialist. They can give you some ideas on how to manage those numbers and what each of those different methods would calculate out to for the value of your practice. The last section that we want to talk about real quickly is what you can do to increase the value. People often get frustrated with understanding the value after it’s too late. What do I mean by that? Well, in order to look at any of the valuation methods that we just discussed, you need to be able to consistently produce income results. If you’re going off of income, then it’s important that we get ahead of that curve before it’s time to sell, not afterwards. So, I tell people, again, spending some time to go over what the income looks like in your practice so you understand it and you can realize a value is incredibly important as you start planning your retirement or exit strategy. 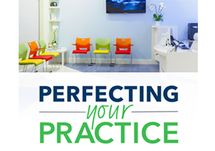 How can we increase the value of your practice? There are multiple methods, but the first and foremost that I always look at is the investments that you’re making into the practice. If you’re going to exit and you’re looking to sell, it’s a great time to start growing the practice and making sure you get ahead of whatever changes in technology might be out there that could help you realize a greater return or a greater income or greater revenue stream for that practice. Another way you can start doing that is working on your training methods and I highly recommend training your front-office staff to maximize efficiencies in the process and to be able to maximize revenue potential from each of your patients. I know, I know; it sounds like we’re getting a little bit out of the human element of practicing medicine, but remember, you’re the CEO of your business and you’re the CEO of your life. We have to look at this as a business, as well as a healthcare industry, to make sure that you’re maximizing the returns on it. Training your staff to maximize revenue per patient and create efficiencies in your processes are one of the great ways you can increase the value of your practice and increase the revenue that’s coming in. Marketing is another one that often gets overlooked. Most people take for granted that you generally receive traffic by word of mouth or foot traffic coming by, but marketing plays a huge role in the industry. Keep in mind that it’s one of the most competitive landscape that healthcare has seen. You have more healthcare practitioners diving into the market, and as we mentioned earlier, you have more healthcare practitioners retiring later on in life, leaving a large population of people out there that believe it or not you’re now competing with every day. We’ve got to continue to find ways to innovate and bring new patients to the door every single day. I always like to say: If you’re not evolving, unfortunately, you’re to become extinct, so we need to constantly look at evolution in every area of our practice. Marketing is one that unfortunately gets overlooked way too often and can definitely help you grow. Another area I like to talk about is hiring – finding the right staff or building the right team. We obviously want to make sure that our patients get the best experience, and in finding that best experience, often it’s a great idea to find someone who specializes in a certain area. So, not just from the inside perspective of collections, but maybe someone who specializes in a different area of practice – and different but complimentary area of practice – that you can add on staff and bring in to go ahead and expand your offerings. Therefore, you’re opening up yourself to more opportunities, a larger patient base, and increasing the revenue overall. Another area we should talk about is office improvements. Let’s face it – people, for the most part, are vain. They want to see a nice place to come in when they go and meet with their doctor, so improving your office not just from a technological perspective, not just investing in newer technologies, more efficient technologies, but also in increasing the quality of the appearance of your office is a huge way for you to be able to grow value. That helps drive in more patients, and the more patients you have, the more revenue that you’re creating. Aesthetically, it becomes a much more pleasing place to be and it continues to grow and attract more buyers just by the visualization aspect of it. Let’s recap real quickly. #1: We want to make sure that as we’re looking for exit strategies and we’re looking for how we will go ahead and retire in the latter years of our career, that we start planning early on. So we need to understand the value of our practice today. Secondly, you want to make sure that you’re looking over the different methods of creating valuation for your practice and understanding which one applies more to you and which one is being used in your marketplace. An easy way to do this is to work with a professional in your area who lists practices regularly, who’s transitioning healthcare professionals in or out of practices, and with some consultants that can help you understand how to increase the value. Thirdly, you want to make sure that you’re investing in your practice. Remember, if you’re not investing in the practice and you’re not growing it or not evolving it, unfortunately, it will become extinct. You will lose value and you won’t realize everything that you worked so hard for over the last several years. I’ll remind you that right now, healthcare is in a tremendously competitive environment. It’s growing and changing by the moment. Regulations are changing, insurance is changing, the economy is changing, the services that are out there, the new and evolving medical technology is making it more and more competitive every single day. It’s critical that you understand that if you don’t get ahead of the curve and start understanding the value of your practice and working hard to improve it, you will go ahead and lose out on the opportunity to realize everything that you’ve put into it. That’s all I’ve got. I hope you enjoyed this session and look forward to talking with you again in a future podcast how we can perfect your practice. Do you know how much your medical practice is worth? Do you know how much your medical practice is worth? Host Keith W. Gruebele explains why should know your practice value, how to evaluate your net worth, and what you can do to increase your practice’s value.